An illegal fishing boat has run aground and been found abandoned in crocodile-infested waters in northern Queensland, Australia. Authorities have found 11 people and think more are hiding in mangroves near Daintree, north of Cairns. It is unknown if those on board were illegally fishing or if they are refugees, but border force officers are on the scene. About 40 people are thought to have been on board, reports say. The Department of Home Affairs said the first priority was to confirm all those on the boat were safe. Queensland state MP Michael Healy told ABC News that the situation was unclear but officers were at the scene. “We don’t know whether these are illegal refugees or we don’t know if these are fishermen who were maybe fishing illegally and have ended up in Australian waters and the boat’s gone bad and they’ve got trapped,” he said. Local Mayor Julia Leu told ABC there was concern that people were “putting themselves at risk in known crocodile habitat”. Some reports say the 11 men rescued are Vietnamese, while others say they are Filipino. If the boat was carrying asylum seekers, it would be the first successful landing by such a vessel in Australia for years. 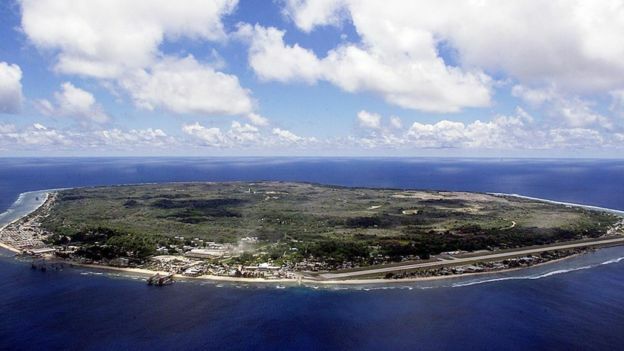 Australia transports asylum seekers who arrive by boat to off-shore processing centres in Nauru and Papua New Guinea’s Manus Island. Even if found to be genuine refugees, they are already blocked from being resettled in Australia. They can either return home, be resettled on Manus or Nauru, or go to a third country. Australia sent five Chinese men home in 2017 after authorities intercepted an alleged people-smuggling boat in the Torres Strait south of Papua New Guinea. The country mooted plans in 2016 to bar any asylum seekers who try to reach the country by boat from ever being able to enter.